I was privileged to be in this week’s Geek’s Guide to the Galaxy in which host David Barr Kirtley interviewd me, Matt Kressel, and Jack Dann about Jewish science fiction and fantasy. Listen to the podcast here. (Among many other things), Matt talks about Jewish mythology, and how Jewish symbols have become cultural staples–such as Leonard Nimoy’s Vulcan salute. Jack Dann talks about how the attitudes toward Jewishness in science fiction have changed in the past century. I talked about my experience editing The People of the Book: The Decade’s Best Jewish Science Fiction and Fantasy. Relatedly, I’m looking forward to Matt Kressel’s new book, KING OF SHARDS. Quoting its description, “Across the ineffable expanse of the Great Deep float billions of shattered universes: the Shards. Populated with vengeful demons and tormented humans, the Shards need Earth to survive just as plants need water. Earth itself is kept alive by 36 righteous people, 36 hidden saints known as the Lamed Vav. 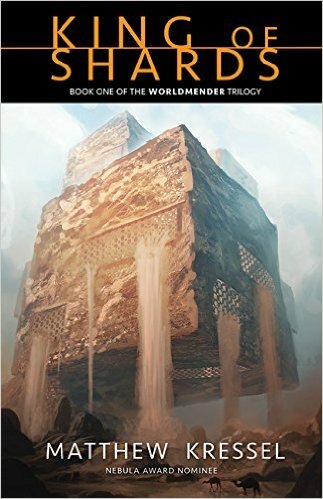 Kill but a few of the Lamed Vav and the Earth will shatter, and all the Shards that rely upon it will die in a horrible cataclysm.” I love Matthew’s facility with bizarre world-building, and I’m excited to see what he does with it in novel form. This isn’t really a horror story, but it is about a ghost. When I was little, Princess Diana was a figure who loomed large. I had paper doll books of her fashions, knew what her wedding dress looked like. Reading her biographies was interesting; most seem to take a particular slant on her. I ended up siding with the more sympathetic, she seems to have been very young and naive when she got entangled in the royal mess. This is also the last poem of mine that I’ll be linking to here, unless I start reprinting stuff online or publishing something new. I’m planning to replace these entries with writing advice columns. If you don’t know what Patreon is, it’s a website that helps fans connect with artists they want to support. Some (like my friend Barry’s) work on a per creation basis (he gets paid per cartoon); others are monthly. Carmen Maria Machado is one of my favorite new writers, and probably one of my favorite writers period. I hadn’t planned this deliberately, but she’s actually a very talented horror writer, so yay for continuing the October theme. Whether or not you end up supporting her Patreon, check out her stories; it’s worth it. This is one of the scariest stories I’ve read. When I gave it to my students a few years ago, they agreed. It’s chilling, with excellent character work, and Daniel Abraham’s consummate craft. Trigger warning for violence against children. This entry was posted in Reccommendation roundup by Rachel Swirsky. Bookmark the permalink.